Weather plays a big part in this game. Rain effects the handling a little. 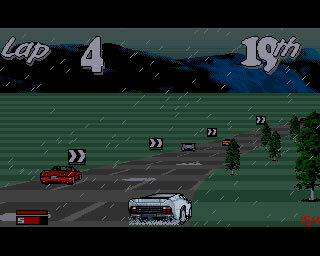 Dripping with quality, and doing the actual car itself damn proud, was Core Design’s Jaguar XJ220. 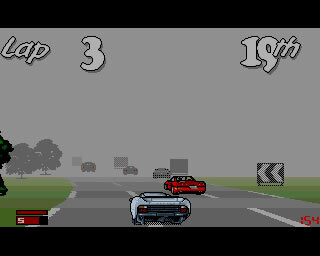 Released during the Amiga’s purple-patch, it took the baton that Gremlin Graphics’ Lotus Esprit Turbo Challenge had set off with two years earlier, and probably just about pipped the lot at the line in the exciting race entitled “100m for Amiga racing games that all look and play roughly the same”. So, what set it apart from the pack? Well, let’s start with the opening screen of the Jag rolling across the screen and revving up just enough to whet the appetite. The ensuing intro music sounded like Level 42 attempting the Seinfeld theme, and inexplicably – it was great! The rest of the music was quite simply some of the finest featured in any Amiga game, from tranquil beats to ravey-house numbers that wouldn’t have sounded out of place in the Haçienda (well, maybe a little, I’m getting a bit excited here) – and the cherry on the cake was a little dashboard-style CD player where you could play any of the six tracks at your own leisure. Not an earth shattering idea today, but in 1992 – totally refreshing and innovative. The fog uses some rather nice effects, pre anti alias days of course! For some, it was an appealing side-dish to the main course of the Lotus series (Lotus 2 being most people’s favourite) and the serious, simulation of Geoff Crammond’s Formula One Grand Prix but for others including myself, I think it topped the lot just through plain class and likeability. When you look at what you want from a racing game, it simply ticked all the boxes. An impressive and stylish front-end, longevity through the track editor, great graphics and sound to help you on your way and above all else, it gave you a darn good race. Core, indeed.